Computadora Feliz aka Happy Computer is a new upcoming mysterious band from Berlin rocking C64/8-bit/circuit_bending/chip/micromusic-style. This is their first videoclip.. wuhuuuuu! for those around Cologne, there will be a public screening of the video and other short movies tomorrow the 25th April - 19.30h at the Borderline Film Party no.72 happening in the BloomClub / Alte Freiheit 31 / Wuppertal. For those who missed last year the fantastic trio from Finland there is another tour coming up very shortly !!! Don't miss it! 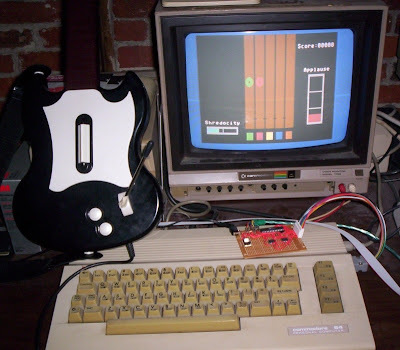 Yeah, Toni Westbrook's writes about his progresses with the Guitar Hero project for the C64. For those who wonder, Shredz64 is (will be if successful!) a game for the Commodore 64 that makes use the playstation guitar controller hooked through the PSX64 interface. It is in the beginning stages right now, with only button testing and some graphics routines done, but is on a steady track. There is a good chance Shredz64 will make use of SID and/or MID files for its music, though with channel constraints, SID files are more likely than MIDI files off the bat. Lots of very promising progress tonight (and a few nights ago). First off, I implemented code that will read both note data for fret buttons and music data from SID files off of floppy disk. I also wrote some quick utilities on my Linux box to generate note files for testing. So all the static values are out of the program and its reading off files now. More importantly though, I implemented a good portion of the SID -> Shredz64 converter tonight - this sounds much fancier than it actually is. The issue is normal SID files are big blocks of 6502 machine code that have been ripped (or created), but they contain code for manipulating the processor, memory, etc as opposed to just being music data. Not only does this waste CPU time, but its also difficult to switch back and forth between executing Shredz64 code and executing SID code. My solution for now was to hack the libsidplay library on my Linux box, and intercept any memory writes to the virtual SID chip (0xD4XX) and dump the address and the value to a binary file, along with the relative time the memory write was made. E.g. I play a SID file on my computer, and in addition to playing it it dumps all the SID chip data to a file. Shredz64 then uses that file as its music data. Actually, I didn't implement the timing tonight, but I did manually set the timing inside the game just to test it out, and it played the music pretty accurately! Very promising for first try. I do need to compress the files somehow, at least look for repeating sequences, since they get pretty big. Hopefully filesize won't end up being an impossible issue. But hearing music out of the game for the first time tonight sure was awesome! I added the applause meter tonight that shows how well you're doing overall and how close you are to failing. As can be seen, its a vertical bar separated into three sections, filling from bottom to top. When doing well, the bar fill is green, when okay its yellow, and when bad its red. When empty its game over! (Though I don't have a game over yet). Your applause increases when you correctly strum a note, and decreases if you miss a note or incorrectly strum. I also fixed up some bugs recognizing correct strumming, and separated the code out into multiple files now that things are getting bigger. Next up is reading note and song data from files, and then the SID converter plugin! 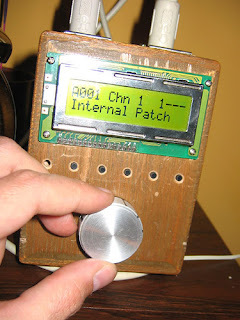 This is homebuilt synth based on Commodore sound chip 8580 (popular SID) There are 6 buttons - 1 for menu, 4 for parameter selecting and one for backlight illumination while in battery mode. Big knob in the center is encoder used for parameter tweaking and menu navigation. everybody say loud: I´m SID and I´m proud. 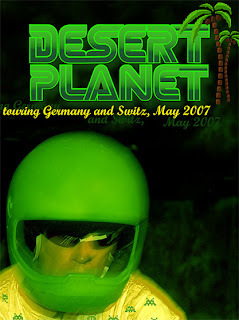 click on photo takes you to the photostream.